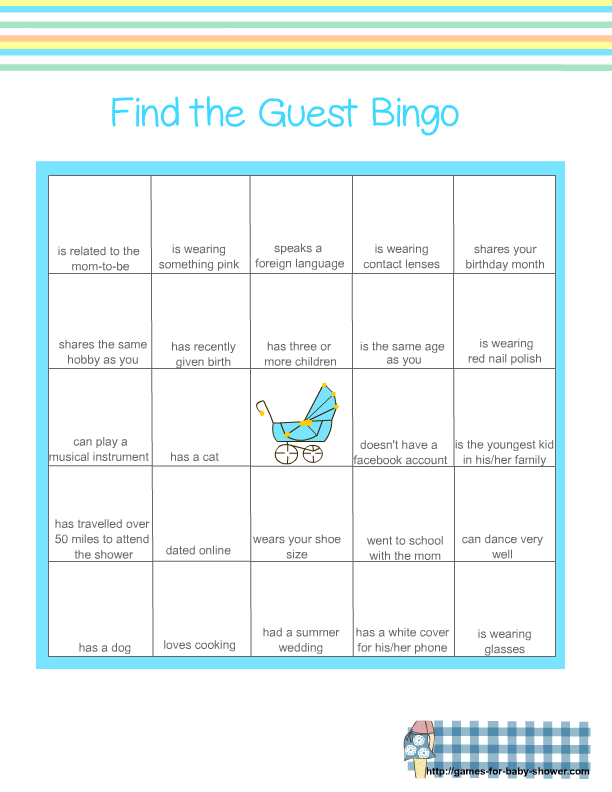 Baby Shower Guest Bingo or Find the Guest Bingo is a fun icebreaker game. The guests will have to mingle in order to get to know each other so they can play this game. On this page I am sharing Free Printable Baby Shower Guest Bingo Game Cards in three different colors. I always make my games in pink color for a girl baby shower, in blue color for boy baby shower and in one gender-neutral color as well. On this page I am sharing this game in green color that is gender-neutral. How to Play: Distribute a pen or pencil and a bingo game card among each guest. Ask the guests to mingle with other guests and write their name in the box that matches the description of that guest. The person who finds the guests in a way that he or she completes a row either horizontally, vertically or diagonally and yells bingo. He or she will be the winner. Get this interesting game for your girl Baby Shower party and it will cost you just ink and paper. Just click on the image given above and save the bigger image in your computer. Print as many copies as you want according to the number of your Baby Shower party guests prior to your party. Your guests will enjoy playing this game for sure. Print copies of these Bingo Game cards in green color for your Baby Shower party. 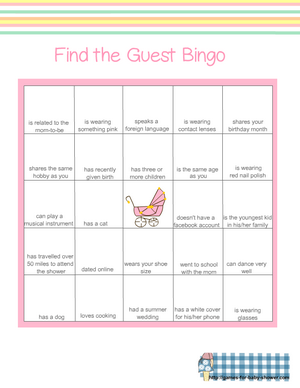 To get this image click on the Baby Shower guest bingo card given above and save the bigger image in your computer.